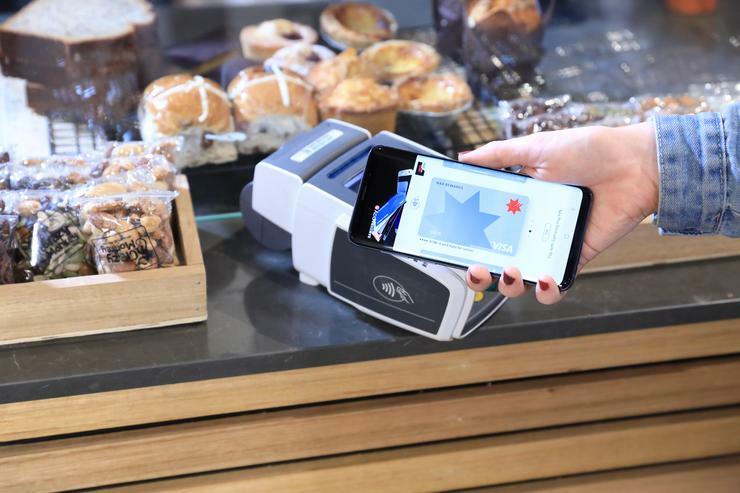 Samsung Pay can now be used by NAB customers, making the smartphone mobile wallet the first to be compatible with all of the Big Four Australian banks, the company announced today. That claim is nuanced however. Commonwealth Bank of Australia, ANZ, Westpac and NAB each offer Android Pay, although with CBA and NAB purchases via Android Pay can only be done via their own-brand apps. Mastercard card holding customers of the Big Four are also able to make payments through Fitbit wearable devices, hence Samsung’s “smartphone mobile wallet” phrasing. Android Pay rebranded to Google Pay earlier this year, and while ANZ, CBA and Westpac are listed among the supported banks, NAB is not. “Our partnership with NAB builds on our commitment to providing a simple and secure digital wallet experience to every Australian using a Samsung smartphone or wearable” said Mark Hodgson, head of product and services at Samsung Electronics Australia. “Today’s announcement also represents an important milestone as we are now able to provide Samsung Pay to all major banking customers across the nation. We believe that our collaboration with partners like NAB will help further enhance our mobile experience for Australians and look forward evolving the portfolio further over the upcoming year,” he added. Samsung Pay launched in Australia in June 2016 and to date, has partnered with more than 45 banks here. Android Pay launched a month later, while Apple Pay had been offered to ANZ American Express and Visa cardholders since April 2016. While Apple and Android Pay utilise a smartphone’s near-field communication (NFC) chip to transmit payment options to merchants, Samsung Pay uses a combination of NFC and magnetic secure transmission (MST) – a technology that emits a magnetic signal that mimics the magnetic strip on a traditional payment card. “In addition to our own mobile banking app and NAB Pay, we are continuing to invest in giving our customers the best digital payments experience. We know our customers increasingly want to be able to pay for their purchases quickly and conveniently, and Samsung Pay is a safe and secure digital wallet that they can now use,” Gilfillan said. Having embraced Android/Google Pay and Samsung Pay, the Big Four are still split on Apple Pay. In March last year Commonwealth Bank, Westpac, NAB and Bendigo and Adelaide Bank were denied permission from the Australian Competition and Consumer Commission (ACCC) to collectively bargain Apple regarding Apple Pay. The banks sought authorisation to bargain with Apple for access to the NFC controller in iPhones, as well as reasonable access terms to the App Store. The access would enable the banks to offer their own integrated digital wallets to iPhone customers in competition with Apple’s digital wallet. Samsung Pay has now paired with over 40 payment card brands globally and partnered with more than 870 banks. The platform offers multiple security features; including a tokenised card number for the user, which means no sensitive payment card information is stored on the device, and pre-payment authentication via PIN, iris or fingerprint.